Boracay is the toast of the town now, bagging international awards here and there. But there was a time–and we saw it then, on a family vacation in the early ’90s–when the island was less crowded and the beachfront was bigger and cleaner. It has changed a lot today, but the best things have stayed the same: the sand is still super fine, the sunset can still silence anyone, and the waters still gleam turquoise in the sun. If Boracay were an ex-boyfriend, he’s the kind you’ll come back to no matter how many times you think you’ve found a better guy. You could wander, hopping from island to island–which is tempting in a country with 7,107 of them– but in the end, you’ll find yourself back in Boracay’s arms, knowing in your heart, it’s The One. Unfortunately, when the summer fever hits, you’ll find that you’re not the only one who has come to that conclusion; fortunately, love would teach you to live with the fact that you have to share the best island in the world with a gazillion other lovers. It’s not the sweetest thing. February marks the start of the peak season in Boracay. I stared at the crowd on the turquoise waters – yup, there were enough people for a sea party. I looked around: the white sand was dotted with pink hats, blue beach blankets and tie-dyed sarongs. Everybody was here. My heart sank a little. It was the first time in almost 10 years that I went to Boracay on a peak season, even if it was only February. I suppose if I had done a little research – tourist arrivals reached 1.2 million last year, most of them flying in from February to May–I would not have been so disappointed. I realized then that I had been spoiled by trips here in June, when the island was its bare, quietly beautiful self, and I could revel in its embrace without hitting another human being. I just wasn’t prepared to share my piece of paradise. I made a mental note to come back at another time when, on the way to our resort, I removed my slippers out of habit. My feet sank in super soft, powdery fine sand. I stood there and burrowed for a good minute until all that peeked from the white sand was my yellow nail polish. It was a familiar feeling. I was in love again, despite the crowd. Obviously, I wasn’t the only one. A blonde in a silver-blue two-piece bikini, a European, had commissioned the local kids to make her a sand sculpture (they charge around P300 for this). She watched, smiling, as the final touches were made. Then she knelt over the sandy proposal and asked one of the local kids to snap a photo of her. She posed with a flourish of her arms. Every beach bum took out his camera. While Filipinos have long been aware of Boracay’s allure, it’s only in the last few years that the rest of the traveling horde has been updated. In the last three years, it seemed every travel authority has crowned Boracay the winner in a pageant of beach destinations. Hotel booking site Agoda.com announced just this January that in its survey of 113,000 respondents, Boracay emerged as the top choice for relaxation and the third choice for nightlife, proving that on this 7-km stretch of fine sand, you can have a rocking party on one end and gentle flow yoga on another. In Travel + Leisure’s World’s Best Awards 2012, Boracay was voted World’s Best Island, beating Maui, Galapagos, Santorini and Bali. 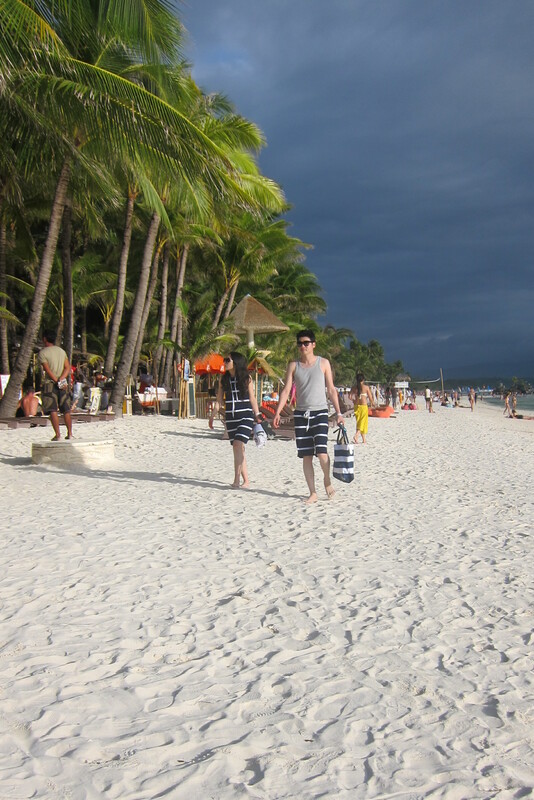 In its February 2013 issue, the magazine named Boracay one of the world’s Five Most Romantic Destinations. As if to prove a point, a commotion near Willy’s Rock, Boracay’s famous landmark, interrupted our walk toward Merly’s BBQ, self-proclaimed peddler of the island’s original chorizo burger. There was shouting and scurrying and self-conscious laughter. We had to see this. As my husband and I elbowed our way through the kibitzers, we spotted a well-dressed couple seated at a table set up on the water, about ankle-deep. There was a chef, a violinist and a glorious sunset. A photographer was precariously balancing himself on a ladder, dishing out instructions (I think). They were oriental, although I couldn’t quite make out the language. It was either Korean or Chinese. Of the 473,286 foreigners who trooped to Boracay last year, East Asians were the top visitors: 156,445 South Koreans, 92,209 Chinese from Taiwan and 82,358 Chinese from mainland China. Also logged in were 690,872 locals and 42,094 Filipinos from abroad. The influx of foreigners is evident in the food choices available on the island – Indian, Moroccan, Italian, German/Austrian, Japanese, American, Chinese, Greek – but if you’re a foreigner, it’s only right that you would want to try the Filipino fastfood, and Boracay does not disappoint here either. Mang Inasal and Andok’s are two of the most crowded restaurants at D’Mall. The food is good and cheap and very Pinoy. In case a craving for the comforts of the city creeps in, there’s Starbucks, McDonald’s, Yellow Cab, Dulcinea, Sbarro. If, however, you prefer a bar where you can put up your feet and enjoy a quiet drink – and really, this is what people come to Boracay for – seek out the Spiderhouse in Diniwid. If you’re booked at a station 1 resort, you can just walk around the rock that separates White beach from Diniwid beach, past Microtel, through Nami Resort, into a cave, and out to a bamboo bar that looks like it came straight out of the movie The Beach. Leonardo isn’t there but his kind is – Caucasians with either a book or a beer or both, lounging lazily on the pillows and chairs with an unobstructed view of the water. You can even swim to a raft nearby and sunbathe in your naked glory. Tricycle fares are posted at the Cagban port in Boracay. Rates depend on the location of your resort.